This project explores how the incessantly inscriptive and totalizing nature of contemporary technologies have their roots in Greek myth and ancient artifact. 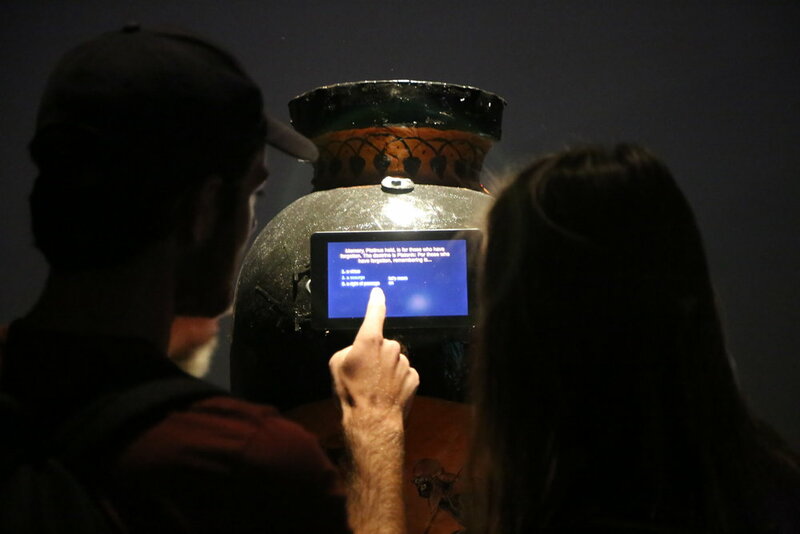 The work consists of an approximately two foot tall Greek urn which displays a small touchscreen which facilitates a hybrid encounter between current and ancient technology. The touchscreen leads the participant through a series of questions that suggest a linear, positivistic quest for knowledge that is then continually undermined. Initially the viewer/participant is asked 'Would you like to know what Automatons are?" If she answers "yes”; the answer is revealed. However, the screen then flashes a message telling the participant she has lost. 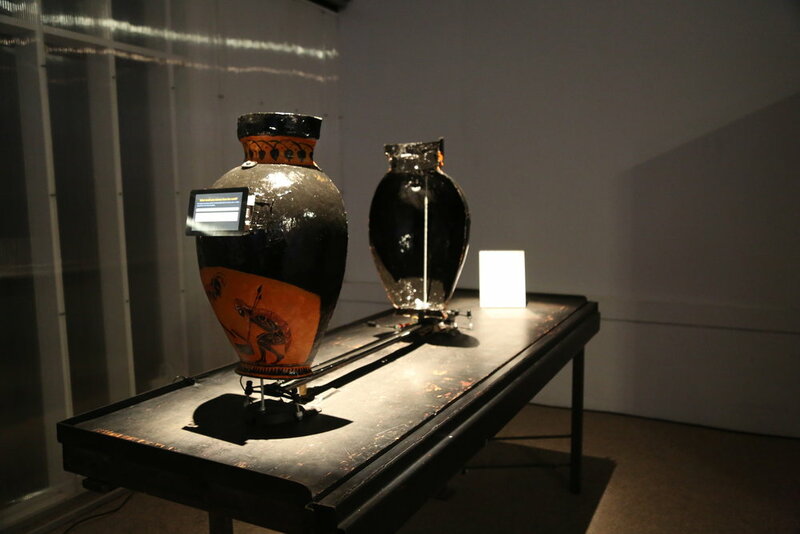 The urn, powered by a stepper motor attached to an Arduino controlled camera rig, then cracks slightly along with an audible cracking sound. Subsequent questions related to ancient myths, automatons, and cyborgs ensue on the screen, including quotes from Donna Haraway, Hannah Arendt and Mircea Eliade. But, the more the participant requests to "advance" or "learn" by obtaining answers, the more the vessel breaks apart, eventually separating into two distinct halves which clearly reveal the technological mechanisms of its insides. Once fully apart, the game on the touchscreen becomes a new game which asks "What would you like to remove from the world?" Under the hood of the app is a file that saves all the user inputs and collates them into a list of top ten most requested elements. If the user's answer is one of the most commonly entered, the urn closes back up slightly a whooshing sound ensues, and the participant is informed that their entry has been removed from the world. When the urn is again fully closed the prior game resumes. The dominant discourse of the Bay Area seems to suggest that increased investment in the technological and the scientific will save us from all things that the technological and scientific brought upon us ( i.e. global warming, social isolation, vehicular deaths, lack of exercise etc.). Though Hephaistos made Pandora out of clay, he was approached by the gods as the craftsman because of his skill in building Automatons (large metal creatures who could think and act). In our place and time, where hardware hacker labs and bio hacking labs appear side by side, this shouldn't seem strange. The Gods sent Pandora to man with a jar of negative things and a bout of curiosity as punishment for Prometheus stealing fire, an act that they feared elevated man to a God-like status. As we currently approach a preoccupation with technology rivaling that of Hephaistos -using CRISPR on human embryos, considering the threats of DNA malware, and storing data in inert DNA -the contemporary echo of the origin of Western civilization portends its termination. I am interested in examining the origin of Western civilization and the impending redaction of it in the same object. If we can recognize the Western idea of progress as both finite and futile, perhaps we can escape it. The artist would like to give special thanks to Noa Bar and Blaine Gilbreth for their assistance.